Amey and her three children, 16-year-old Nayira, 13-year-old Ni’Shawn, and 9-year-old Richard, will be moving in to one of five Buckeye neighborhood houses recently renovated by North Carolina-based Ply Gem, a leading manufacturer of exterior building products, and the Greater Cleveland Habitat for Humanity as part of Ply Gem’s Home for Good project. 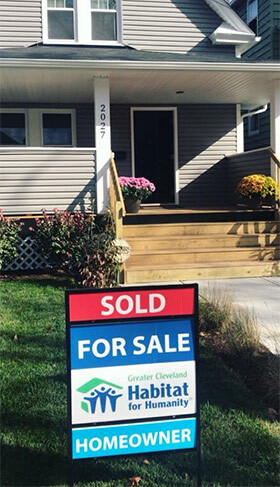 Sixty-eight percent of Cleveland families earning only 30 percent of the Area Median Income spend more than half of their salaries on housing. That statistic makes it difficult for hard-working families to move up and achieve stability. So, in July, Ply Gem teamed up with the Greater Cleveland Habitat for Humanity, hundreds of local contractors, and countless volunteers to make a difference in the Buckeye neighborhood—transforming the exteriors of four homes along E. 130th Street and one home on E. 134th Street that needed repair into affordable neighborhood gems. The renovated homes are between 1,800 and 2,000 square feet. Cleveland has seen more than 7,000 abandoned homes since 2013, when Habitat shifted from building new homes to renovating existing, blighted, and abandoned homes. John Habat, President and CEO of the Greater Cleveland Habitat, says the organizations often looks for community partners to create affordable housing options, so Ply Gem’s offer to team up in Buckeye was ideal. The project is part of Ply Gem’s Home for Good project. By partnering with Habitat for Humanity and 20,000 volunteers, and with more than $1.8 million in product donations, the group has built or renovated more than 450 homes in 70 U.S. communities since 2016. Grammy-award winning musician Darius Rucker is the national ambassador for Home for Good, and double-platinum recording artist Lauren Alaina is the regional ambassador working on the Cleveland project and was at the completion celebration on Wednesday, August 1. Amey, who works at Care Alliance Health Center and was living near Kinsman Road in a three-bedroom home she rented through the Cleveland Metropolitan Housing Authority (CMHA), says she was tired of the financial strain she bears through renting. So, she applied to Habitat to become a homeowner. For Amey’s daughter, Nayira, the effort was doubly meaningful as she worked on her new home via the Building Great Futures program—an initiative by Habitat for Humanity, Boys and Girls Clubs of Cleveland, and Youth Opportunities Unlimited that provides teens with the opportunity to enhance their skill sets through practical construction experiences. Nayira spent her summer fully rehabbing her own home with 15 other teens in the program. While Amey says her financial situation had left her feeling that the chance of being a homeowner were slim, she believes the Home for Good program made owning a home possible, as well as allowed her to set an example for her children that they should never give up on their dreams. Ply Gem’s Frye says the biggest challenges to this project also provided the greatest rewards, in that finding experts to do the work in such a short timeframe was difficult during the busy summer construction season. She calls the dozens of people who stepped up “hometown heroes,” volunteering their time and skills to make a positive difference in the Buckeye neighborhood. “In addition to working alongside the Hometown Heroes, countless neighbors stopped by throughout the eight-day remodeling process to express their thanks and tell us that the renovation of these homes would new breathe life back into their neighborhood, give the community hope, and even motivate them to take better care of their own homes,” Frye says. “To have played a role in this positive transformation in Cleveland is the reason the Ply Gem team created the Home for Good project."